The global linear low-density polyethylene market was valued at US$ 43,974 Mn in 2017 and is anticipated to expand at a CAGR of 5.34% from 2018 to 2026, according to a new report titled ‘Linear Low-density Polyethylene Market: Global Industry Analysis, Size, Share, Growth, Trends, and Forecast, 2018–2026,’ published by Transparency Market Research (TMR). The global linear low-density polyethylene market is driven by rise in the demand for retail packaging, agricultural films, and consumer goods. In terms of production and demand, Asia Pacific accounts for a dominant share of the global market. High popularity of flexible packaging and films for use in packaging is largely attributable to several technological developments that have been made in the field of flexible packaging. Linear low-density polyethylene is used in flexible packaging applications due to its high flexibility, good low?temperature performance, excellent durability and high barrier to moisture. Linear low-density polyethylene has higher tensile strength than LDPE and it exhibits higher resistance to impact and puncture than LDPE and HDPE. LLDPE has several physical characteristics that make it perfectly suitable for use in the production of flexible packaging. These characteristics include light weight, resistance to chemical reactants, and malleability. The ability of LLDPE to be stretched into thin coatings and sheets is thus crucial, as flexible packaging requires tensile materials. This trend of utilizing LLDPE in packaging is a major driver of the global linear low-density polyethylene market. Several countries do not have an established waste collection and sorting system for solid waste. Collection and sorting of plastic waste is the first and crucial step in plastic recycling. Manufacturers of plastic products add several additives, pigments, modifiers, and fillers in order to induce properties such as high density, elasticity, rigidity, and color in products. However, these additives create issues while recycling. This, in turn, results in poor quality of recycled plastics. Prices of oil and gas directly affect plastic manufacturing costs. Volatility in prices of oil and gas affect the cost of raw materials required for virgin plastic production. Most plastics are non-biodegradable and remain in the environment for several decades. Hence, various regulatory legislations have been imposed on the manufacture of plastics and their usage in different end-user industries so as to regulate production of plastics and plastic waste. Thus, the plastics industry is estimated be hampered by strict government regulations and recyclability issues in the next few years. Based on process type, the global linear low-density polyethylene market has been classified into gas phase, solution phase, and slurry loop. Gas phase is the dominant segment of the global market. It is anticipated to expand at a rapid pace during the forecast period. The gas phase process offers several advantages such as it has low initial installation costs, low temperature, and low reaction time. In terms of application, the global linear low-density polyethylene market has been segmented into rotomolding, films, injection molding, and others (including metal coating, extrusion, and masterbatches). The films segment accounted for a major share of the global linear low-density polyethylene market in 2017. The segment is estimated to expand rapidly during the forecast period. The key driver of the segment is high demand for LLDPE from the flexible food packaging industry. LLDPE films are also used in the construction industry due to their thermal and water barrier properties. Based on end-use industry, the global linear low-density polyethylene market has been segregated into packaging, building & construction, automotive, electrical & electronics, agriculture, household, leisure and sports, and others. The others segment comprises electric appliances, medical equipment, and furniture. The packaging segment has been sub-segmented into food and non-food packaging. Among end-use industries, packaging is the dominant segment, due to rise in the demand from retail packaging and consumer goods sectors. Based on region, the global linear low-density polyethylene market can be divided into North America, Europe, Asia Pacific, Middle East & Africa, and Latin America. In terms of demand, Asia Pacific held a leading share of the global linear low-density polyethylene market in 2017. The region is a major producer of linear low-density polyethylene. Middle East & Africa and North America are other significant consumers of linear low-density polyethylene. The linear low-density polyethylene market in Latin America and Europe is anticipated to expand at a sluggish to moderate pace during the forecast period. Demand for linear low-density polyethylene in these regions is estimated to rise in the next few years, owing to rise in the demand for canned food products led by increase in population and growth of urbanization. Demand for linear low-density polyethylene in Middle East & Africa and Latin America is estimated to rise significantly in the near future. These two regions accounted for a low share of the global linear low-density polyethylene market, in terms of demand, in 2017. 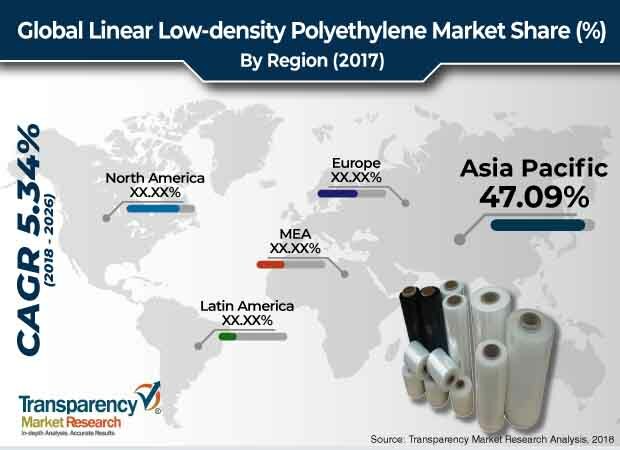 However, these regions are projected to present lucrative opportunities to the linear low-density polyethylene market during the forecast period. The competition in the linear low-density polyethylene market in China is high, due to presence of a large number of players producing linear low-density polyethylene in the country. Key players operating in the global market include ExxonMobil Corporation, DowDuPont, Westlake Chemical Corporation, Saudi Basic Industries Corporation (SABIC), China Petroleum & Chemical Corporation (SINOPEC), and Reliance Industries Limited.